All Seasons German Short-haired Pointers, located in southwest Saskatchewan, Canada, has been a dream many years in the making. Our family got our first German Short-haired Pointer five years ago. She was an instant hit with the kids and the perfect companion for an avid bird hunter. Of course we wanted her to be the best trained bird dog possible. So the training began! What a pile of fun! She remained my hunting buddy , the kids sleeping companion, and my wife's running mate until her unfortunate early demise in the fall of 2014. Thankfully, we already had a new buddy that was full of spirit and vigor to keep us busy. Lyuda came to us from Kalispell, MT. Her desire to hunt was obvious from the very beginning. Thank goodness our family had just moved out to the country and she had all the space she needed. She will be one of our dams. It took a lot of time and research to find Lyuda. And we feel very fortunate to have found, what we feel, is a great combination of hunting desire and family friend. But to stumble upon her older sister... well that was just luck! Through a series of fluky events we received a phone call and was offered an opportunity to buy Abbey. She came to us at 2 1/2 yrs old from a family in Regina, SK. She has the same parents as Lyuda so we did not hesitate to include her in our program. Her hunting instincts were no surprise. It was a decision we will never regret! No breeding program can flourish without a one-of-kind sire. Again many hours talking to many breeders to find just what we were looking for. Well finally the stars aligned in our favor! Let me introduce Montana's Dixieland 405 Twist. Wow! What a dog! Grandson of H.O.F. GSP Dixieland Rusty. Let me tell you, this is a serious animal! With all the pieces in place we are ready to begin breeding in the fall of 2015. 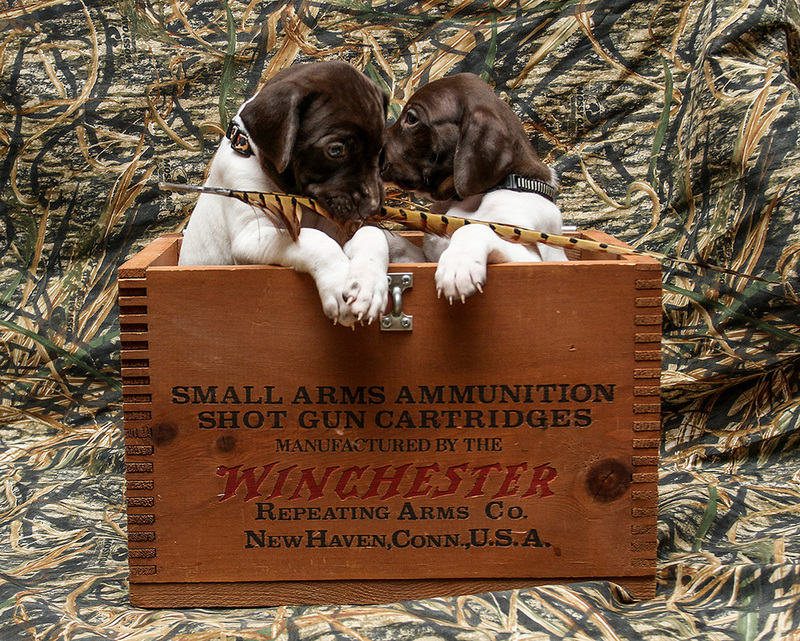 We are excited to find homes for future hunting companions and family friends. If you have questions feel free to drop us a line at 306.773.0527 or email us﻿.